When you’re a professional in the construction and carpentry industry, or even if you’re just an avid DYI hobbyist, a miter saw is a necessary tool in your arsenal. 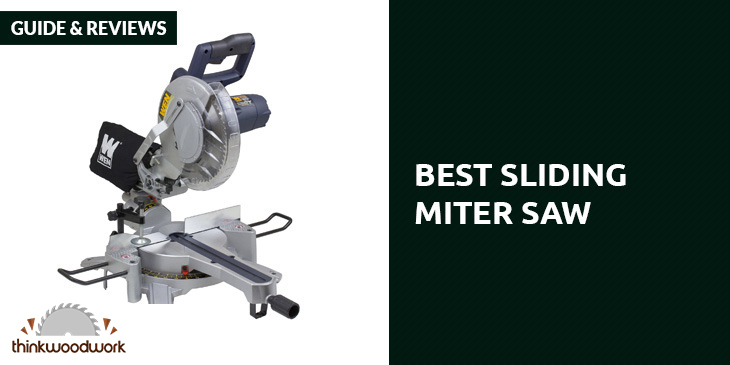 But if you want the best miter saw, you need a sliding compound miter saw. With the best sliding miter saw in your tool case, doing wood work becomes faster, easier, and so much more fun. The advantage of compound miter saws is that the blades pivot left and right, and you can make compound cuts in just a single pass. But the sliding feature makes the miter saw even more conveniently useful, since you can move the blade forward and backward. What this means is that you can get a longer cut with your miter saw than ever before. 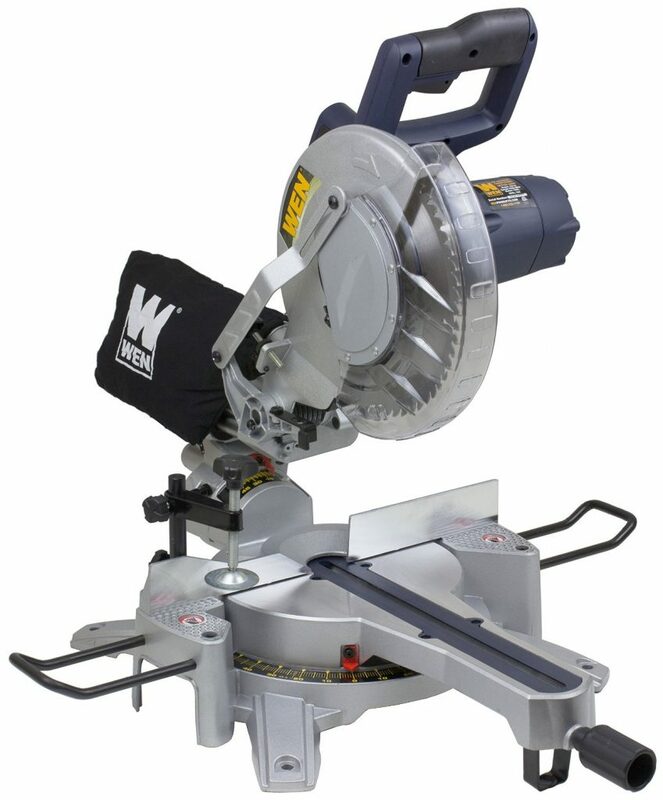 With the WEN 70716 ﻿sliding compound﻿ miter saw, you may not need to buy different types of saws to make different types of cuts. After all, a compound miter saw lets you make for straight, as well as bevel, miter, and even compound cuts. What you get with this particular miter saw is a tool that lets you handle boards up to 3.25 inches thick without any sort of difficulty. After all, the 15-amp motor offers 5500 rpm of power. The work table offers enough room to fit boards up to 11.5 inches deep. It features 2 support arms, a hold-down clamp, and a fence. The automatic blade also retracts for better safety and to reduce the likelihood of accidents. 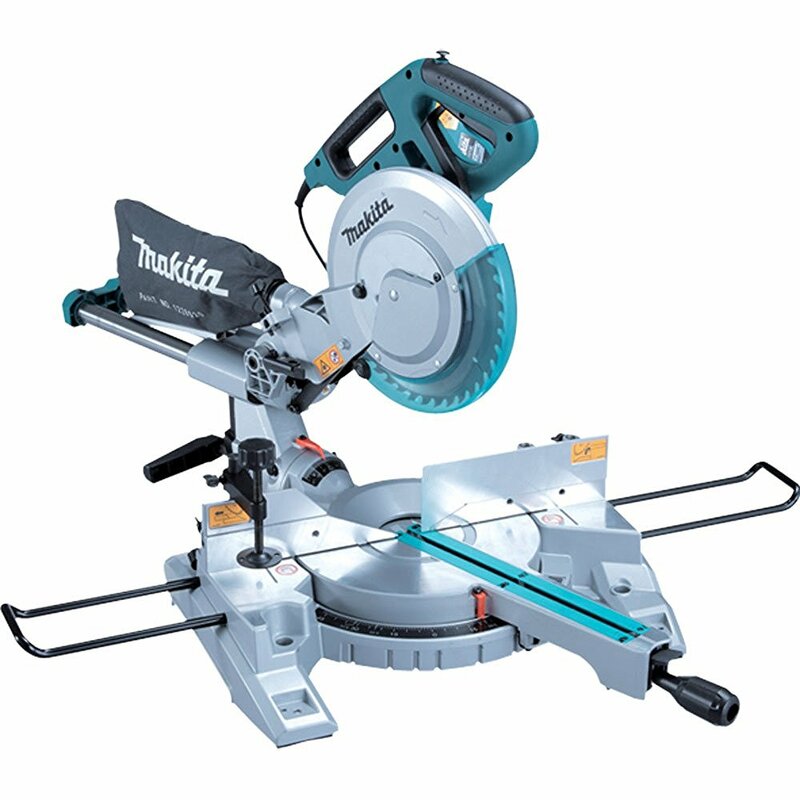 This miter saw miters up to 52 degrees to the left and to the right. It also bevels up to 45 degrees. The preset detents are at 45, 30, 22.5, 15, and 0 degrees. It offers a 10-inch blade, but there’s also a 12-inch version that’s only slightly more expensive. This sliding compound miter saw is actually very portable, as it weighs a mere 30 pounds. It even comes with a carrying handle, so you can easily bring this from your woodshop to your jobsite with no problem at all. It also comes with a 2-year warranty. The Wen customer service can be very friendly, and a large number of trained service technicians are located all over the country. 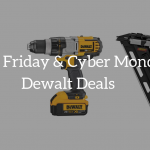 The Dewalt brand is quite famous in the DYI tool industry. 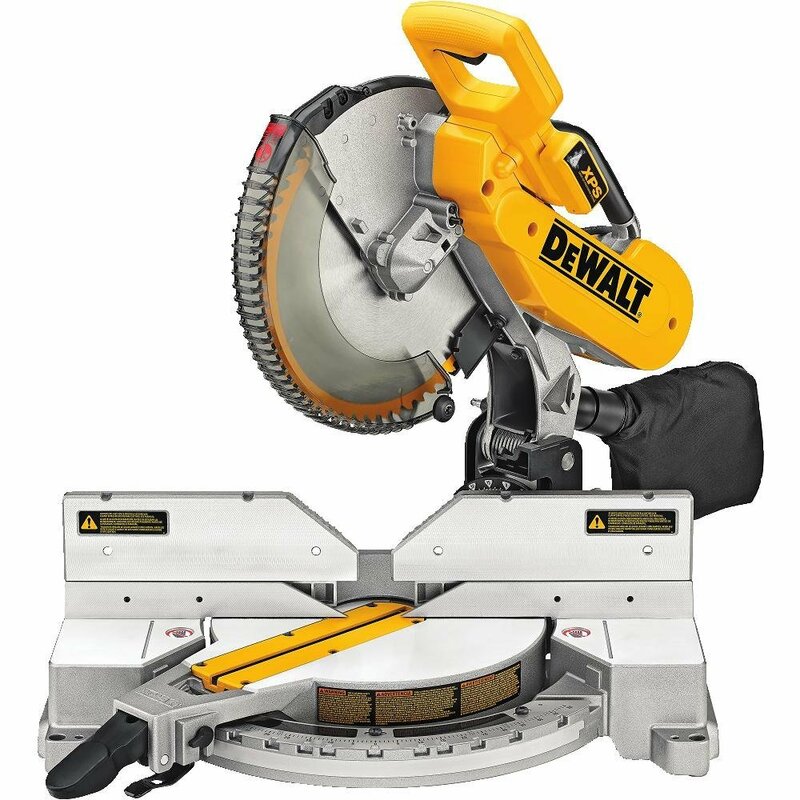 The D﻿ewalt DW716XPS compound miter saw has accumulated a lot of reviews, and the vast majority of them have offered perfect marks. Part of the reason for the extremely favorable response to the Dewalt DW716XPS is because it comes with the XPS Cross Cut Positioning System. This system means you won’t have to make any alignment adjustments, even if you bump or travel with the miter saw. Even a change of the blade won’t require you to make an alignment adjustment. This system also comes with an integrated LED light with high intensity. This light casts shadows on the blade, which then indicates the location and line of your cut. So it functions much like a laser guide. The 15-amp motor allows for 3600 rpm, and it will jump a bit in your hand when you press the trigger. The bevel scale is easy to read, and you can adjust to your preferred bevel preset very easily. You have 9 bevel stops to choose from. The tall sliding fences support base molding up to 6.5 inches vertically against the fence, and crown molding up to 6.625 inches nested. The fences slide out of the way when you make bevel cuts. You can see the blade because of the louvered guard, and you can easily see the miter pointer centered in a window. It’s faster and more accurate, because of the cam-lock with the miter detent override. So if you want to change from a 45-degree angle to a 45.5 degree angle, you can. Many of the reviewers offer updates on their reviews, and attest that it works perfectly even after a few years. The cuts remain dependable and accurate, while the table will rotate smoothly. The limited warranty is good for 3 years, and it’s a testament to the sterling Dewalt reputation for ruggedness. The Makita LS1018 Dual Bevel compound meter saw is a favorite among lots of wood workers, and that’s not exactly surprising. 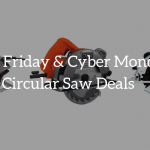 It’s a 10-inch miter saw that offers up to 4300 rpm, and it can cut up to 12 inches at 90 degrees and up to 8.5 inches at 45 degrees. It miters up to 47 degrees to the left, and up to 60 degrees to the right. The positive stops are at 45, 31.6, 22.5, 15, and 0 degrees. You can do “dead on” accurate cuts with the linear ball-bearing system. You can easily access the bevel lock at the rear handle. It adjusts up to 45 degrees left and right. You can cut through wood measuring 3.625 by 12 inches at 90 degrees and through 1.25 by 8.5 inches at 45 degrees. You get a smooth startup with this miter saw’s “soft start” feature, and you get added safety and convenience with the electric brake. It features a D-handle that’s very comfy, with its ergonomic design and rubberized grip. It’s actually compact for a compound miter saw, and its 43.7-pound weight means that it’s possible for you to bring along to a job site without too much difficulty. It even comes with a handle, emphasizing its portability. Who among DYI fans hasn’t heard of the Bosch brand? They’ve been showcasing the excellence of German engineering more than 125 years! 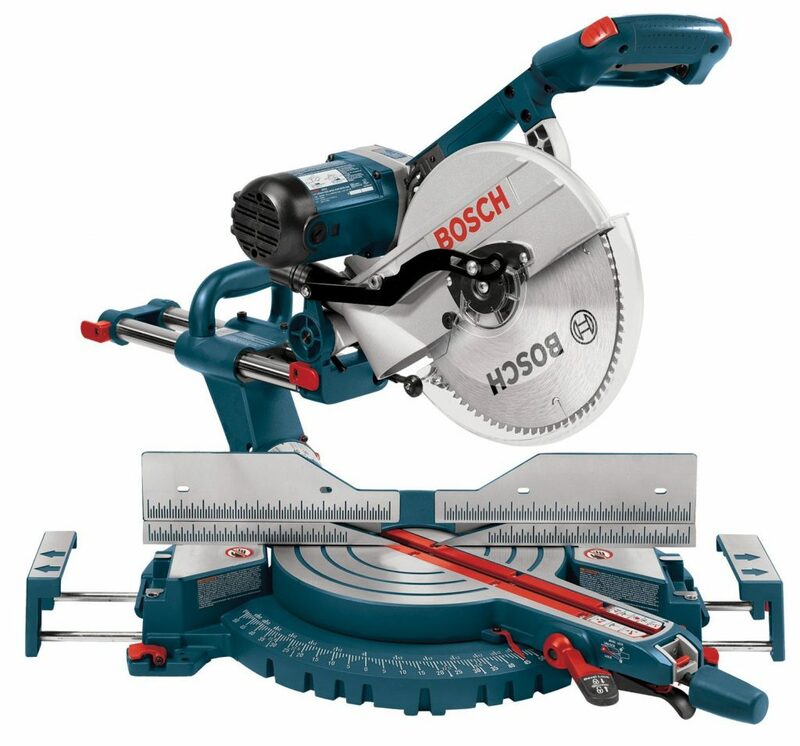 Bosch 5312 Dual Bevel Compoud Miter Saw really shows off just how good a Bosch tool can be.It’s powered by a 15-amp motor, and it can help you deal with a wide range of work piece sizes. The base measures 25.5 inches, and with the cast sliding extensions built in you can accommodate a length of up to 40 inches. Bevel setups aren’t any trouble and you have a greater capacity for cutting crown molding, thanks to the 4.5-inch speed-track sliding fences. The electric brake stops the blade very quickly and this makes it much safer to use. It also allows you to make cuts quickly and repeatedly. Even the blade is good, as the cuts are precise and it stays sharp for a long while. You can depend on this miter saw to make precise cuts repeatedly, as you can easily access the range selector knob and the bevel lock lever. Setting and adjusting your cut angles is easy, as the bevel and miter scales are very visible. You have stops and detents at 45, 33.9, and 0 degrees, but you have a miter detent override so you can choose the angle you really want. The miter angle range is 60 degrees to the right and 52 degrees to the left, with the miter detents at 45, 31.6, 22.5, 15, and 0 degrees. You can get fast and precise crown cuts when you set it to the 31.6-degree miter and 33.9-degree bevel detents. The limited warranty is for a year. As it’s a Bosch, you can depend on this to work for a very long while even with regular use. 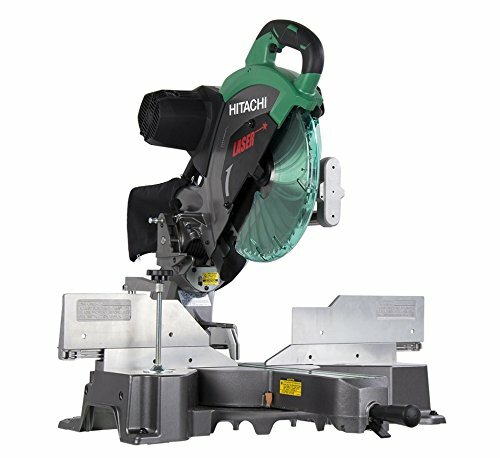 This is the new and improved version of the Hitachi C12RSH2, which has long been considered the best saw in the Hitachi lineup. It offers several features that you may not see in other sliding miter saws. The most notable feature here is probably the zero rear clearance. As you probably know, with other sliding miter saws you will need some rear clearance. But the compacts slide system no longer makes it necessary. Because of the fixed rail system, the saw head can glide effortlessly along the fixed rails, so the rear clearance requirement is eliminated. The slide system reduces the saw’s footprint by up to a foot. That frees up a lot of valuable space in any woodshop. The tall sliding fences also enable you to cut much larger material. They raise the fence height to 5.125 inches so that you can vertically cut crown molding up to 7.5 inches. The bevel angle range is 45 degrees to both the left and right. The miter angle to the left is 45 degrees, and 57 degrees to the right.With the quick settings and stops, and measurements that are easy to read, working with this miter saw is very quick and easy. It’s quite comfy with lots of control too, as the elastomer grip on the vertical handle is soft and ergonomic. As for durability, it’s not a problem. The warranty is for 5 years. If you want to work with wood with a miter saw, why limit yourself? Get the best sliding miter saw you can afford, and you’re able to cut longer lengths with no trouble at all. It makes the work much faster and more efficient, and you’ll get better results in the end.